Welcome to sailing vacations in the Caribbean. We offer sailing vacations of private yachts in the Caribbean in areas such as the British and U.S. Virgin Islands, the Bahamas, the Leeward and Windward islands. Select from a list of Sailing yachts and catamarans in any of these locations. A private sailing vacation on board a luxury catamaran or fully crewed sailing yacht (mono hull) offers you the ultimate opportunity to explore the most beautiful beaches and crystal clear blue tropical waters in the Caribbean. These sailing vacations offers the comfort and flexibility in choosing activities tailored to your special interest. Windsurf all day or relax for hours on a secluded beach. The passionate traveler wants an extraordinary adventure for their vacation; we pride ourselves on knowing where to go, what to do, whom to do it with, and which craft to do it in. When it comes to a Caribbean sailing vacations or any other private yacht charter, there is "NO" consolation prize for booking cheap price. This is one vacation where saving $500 is not wise, unless it is a very valid saving. We have been in this industry for 48 years; our very livelihood depends on making right decisions. A man has nothing if he does not have trust; our company may as well be out of business if you cannot trust us 100%. Our company is totally committed to providing the very best top of the shelf sailing vacations for your family and friends. We honor your business and treat clients with respect; we also honor the rates we provide to our guests. Our product knowledge of each individual yacht and each captain and crew team is what we do best, and we believe our product knowledge is better than our competition. How to put together your private sailing vacation has revolutionized how everyone thinks today. As long as it is our clients who enjoy cutting-edge planning, we are delighted with this. 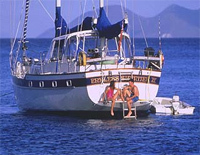 A Sailing Vacation on Catamaran Breanker embarks from Tortolla BVI deep in the Caribbean. While on Breanker you will indulge in the luxury of being pampered by your crew and by Breanker's luxurious surroundings. A Caribbean sailing vacation on catamaran Breanker offers many options. Breanker is one of three sister-ships which have become known throughout the Caribbean as a first choice in private charter yachts. Alaska Antarctica Arctic Australia Bahamas California Caribbean Leewards Caribbean Virgin Islands Caribbean Windwards Central America Croatia Dubai Florida French Polynesia Great Lakes Greece Indian Ocean & SE Asia Mexico New England New Zealand Northern Europe Pacific NW Red Sea South America South Pacific Turkey United Arab Emirates W. Med - Spain/Balearics W. Med -Naples/Sicily W. Med -Riviera/Cors/Sard. Sailing Vacations on Featured Yacht Endless Summer II has 4 equal guest staterooms, each with its own private ensuite bathroom, equipped with basin, head and separate showers. Sailing vacations in the Caribbean, Virgin Islands, Leeward Islands and Bahamas. We offer Sailing vacations in the Virgin Islands, the Bahamas and the wider Caribbean. Virgin Islands Yacht Vacations, Bahamas Sailing Vacations. Caribbean sailing vacations on catamarans, sailing yachts.